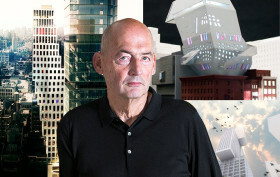 Thirty-eight years after the publication of his acclaimed book “Delirious New York,” Dutch architect Rem Koolhaas and his global architecture firm the Office for Metropolitan Architecture (OMA) seem to have finally landed their first ground-up New York City commission. 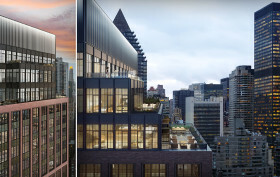 Excavation is already underway at the 22,000-square-foot project site located at 122 East 23rd Street and will soon host a pair of block-through residential towers articulated by faceted elevations and chiseled corners. While there has been no official announcement that Koolhaas is on board, several consultant websites and Linkedin profiles indicate that the Pritzker Prize-winner has been tapped, while New York-based SLCE will serve as the architects of record. To mark the occasion, and as we eagerly await the design unveiling, 6sqft has rounded up Koolhaas’ prior unlucky attempts to build in the city. The proposals befell to the usual suspects that typically stymie bold architecture in the city—community opposition, economic downturns, and the conservative nature of the city’s developers and public sector. *Update 4/21: OMA has confirmed their involvement in the project and share that Shohei Shigematsu, partner and director of the firm’s New York office, is leading the design effort. Last November, 6sqft reported that Toll Brothers‘ upcoming residential building 100 Barrow Street had just made its way above ground to street level. 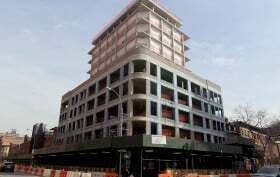 Now just four months later, the West Village development has topped off at 12 stories and 130 feet. As pictured above, the building’s bare concrete skeleton still has a way to go, but it’s expected to be finished sometime late this year or early next year. Since it’s part of the the Greenwich Village Historic District, the building’s designers, Barry Rice Architects, had to win approvals from the Landmarks Preservation Commission. The lower half will be clad in Flemish brick to match the neighborhood’s 19th century aesthetic, while the top will be sheathed in a glass curtain wall with bronze-metallic panels. Toll Brothers’ latest condo development The Sutton has reached its 30-story apex and is currently applying a variety of skins to its frame that its designers hope will capture a “modern vintage” aesthetic. 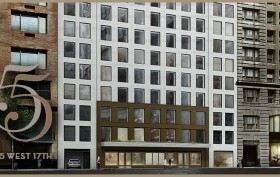 Situated at the boundary of Midtown East’s Turtle Bay and Sutton Place neighborhoods at 959 First Avenue, the 90-unit tower (down from 114-units) will hold one- to four-bedroom residences priced from $1 million to more than $6 million, and provide the typical array of amenities and interiors that reflect the surrounding area’s classic New York vibe. 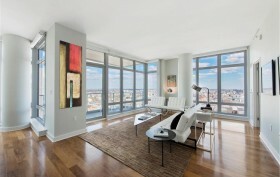 Right this way to see the many sides of this exquisite penthouse….